4 factors to consider when selecting a hot water heater. Is it time to replace my home’s hot water tank? Homeowners all over Northeast Ohio rely on their hot water heaters every single day. If your current hot water heater is eight to 10 years old or has begun to perform less efficiently, it is probably time to upgrade your unit. The hot water heater’s fuel type or energy source. Traditional hot water tanks run on natural gas, propane, or electricity. What type, make, or model of hot water heater you want. There is a diverse selection of hot water heaters on the market today. Tanks with digital displays, anti-scale devices that reduce buildup of minerals in tanks, and glass-lined tanks that reduce corrosion. What size tank your household needs. Hot water tanks can store anywhere from 30 to 100 gallons of water. When deciding what size hot water tank to purchase, you must consider how much hot water your family may use. The hot water heater’s energy efficiency. The amount of gas or electricity consumed by a hot water heater can add up quickly. Because of this, it is worthwhile to consider more expensive but much more energy efficient models. You will easily recoup your costs over time in energy savings. All current model hot water tanks meet the new Federal efficiency ratings. 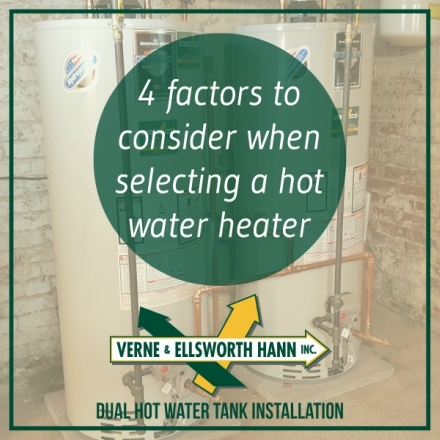 Before you purchase a replacement hot water heater, consult the experts at Verne & Ellsworth Hann to help you select the best system for your family’s needs and install it properly. Verne & Ellsworth Hann, located in Cleveland Heights, is proud to be the preferred hot water tank installation business in Greater Cleveland. We are a full-service heating, cooling and plumbing company that has been locally owned and operated for over 63 years. 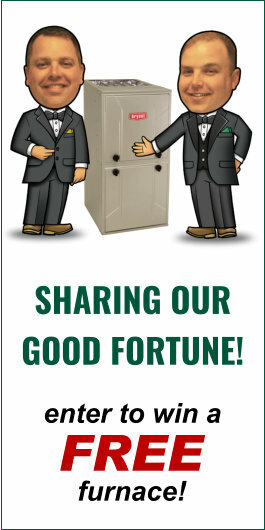 With 5 generations of Hann family experience, we have built a solid reputation for providing the very best hot water tank installation and repair in Northeast Ohio at affordable prices. Our knowledgeable staff will be happy to guide you through the hot water heater selection process and install your new system properly. If you are interested in having a new, more efficient hot water heating system installed in your Northeast Ohio home, Verne & Ellsworth Hann can help. Contact us today to discuss your options and schedule an appointment at 216-932-9755.